After a windy walk home to my Cambridge apartment, I was pleasantly surprised to see a tiny package on my doorstep with a Savannah, GA stamp. When I opened the seal, I found a round of Savannah Bee Company Raw Honeycomb - such a sweet treat from Kara. Savannah Bee Company is one of the iconic honey shops in Savannah and producer of all kinds of honey products. Their wax comb rounds come straight from the source (the hive!) where bees fill the tiny crevices with the golden honey. I opened the seal and broke off a piece right away. The sticky round had a delicate chew and added a nice texture to the smooth, delicate amber liquid oozing out. Since it was Friday, I had cocktails in mind. 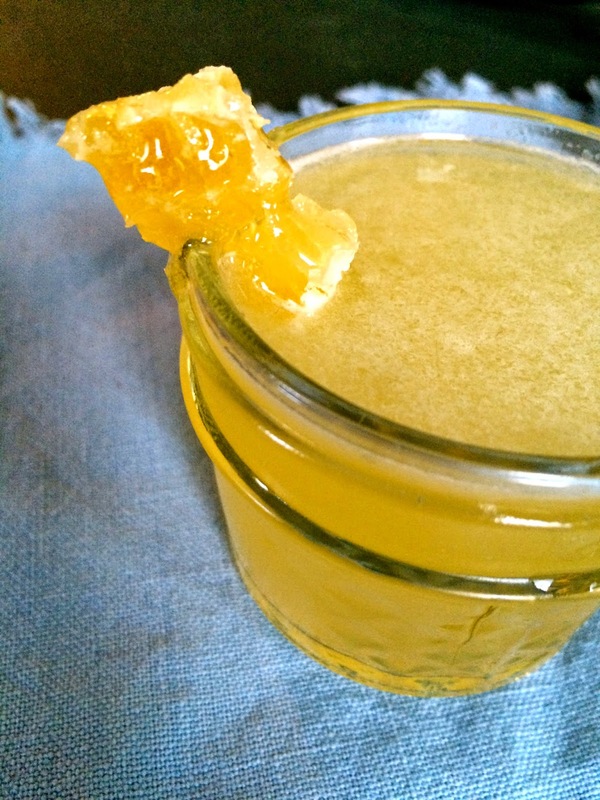 I thought of the Prohibition era drink, The Bee’s Knees which is a mix of gin, lemon and honey. The 1920’s name means “an extraordinary thing,” and I think the touch of honeycomb in its purest form made the cocktail even more buzzworthy. Pour the honey syrup, gin, and lemon juice into a cocktail shaker filled halfway with ice. Shake vigorously and strain into a chilled mason jar or your favorite cocktail glass. Garnish with a piece of honeycomb. Makes 1 cocktail. I enjoyed my version of a Bee’s Knees with a plate of raw honeycomb, goat cheese, toasted almonds and baguette toasts.